This minor update addresses some small bug fixes and enhancements for both Roadsoft and LDC. The 2019 PASER data collection and submission cycle will be affected by the change in the delivery of the updated Michigan geographic framework (MGF) base map. Here are a few highlights that agencies should be aware of. The State is modernizing the software and the process for updating the MGF base map that is used in Roadsoft. This improved format and process will delay the Roadsoft MGF update this year, but should speed up updates in successive years. Historically, Roadsoft has included an updated MGF in the version released before April 1. This year’s Roadsoft spring release will not include an updated MGF, so PASER collection will start on MGF V17. The CTT is actively working with the State to troubleshoot, test, and integrate MGF V19 into a future Roadsoft release planned for the summer of 2019. 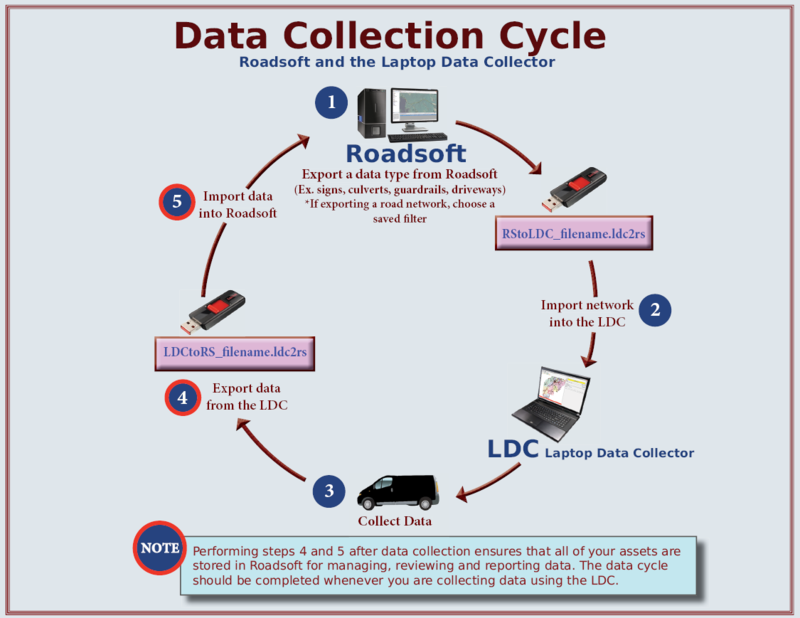 Roadsoft and the Laptop Data Collector (LDC) should be on the same release version to ensure compatibility. If Roadsoft is updated to a version with MGF V19 while there is still LDC data in an older version using MGF V17, the LDC data files cannot be imported back into Roadsoft. Whether you are updating Roadsoft or LDC, migrating, or submitting data, always make sure to import data from the LDC into Roadsoft first. This ensures that all your data is in the same version and is compatible. It’s also recommended that you create a Roadsoft backup after importing the LDC data. The version of Roadsoft that will include MGF V19 will be released during the summer of 2019, and while this shouldn’t cause an issue for agencies that collect data during the spring or fall, it could be an issue for agencies collecting data in the summer. Once data collection starts, it’s recommended that the agency finish collecting data on the same version they started with to avoid potential issues with different MGF versions. Local agencies can collect PASER or any other data (sign, culvert, etc) using Roadsoft releases that use either version of the MGF. However, local agencies and their RPO/MPO will need to coordinate, as once the RPO/MPO upgrades to MGF V19, the remaining agencies yet to collect PASER data will need to upgrade to MGF V19. RPO/MPOs can collect and receive data in either MGF V17 or V19. However, once the region migrates and begins working in MGF V19, all subsequent data collection must be done in MGF V19. If a local agency upgrades to MGF V19 prior to collecting PASER data and prior to the region upgrading to MGF V19, the agency may have to postpone their PASER collection until later in the season to accommodate the RPO/MPO and other agencies in their region. DTMB/CSS would prefer that all data submitted to TAMC is using MGF V19. Regions should wait until all of the local agency PASER data is collected before submitting the data to TAMC. Prior to submission, all data collected using MGF V17 can be migrated to MGF V19. If you have any questions about the 2019 PASER Data Collection process, Roadsoft updates, MGF updates and data migration, or would like all of this explained further, don’t hesitate to contact us at 1-906-487-2102, or ctt@mtu.edu. Roadsoft spring software releases have historically included an update to the MGF base map that required Roadsoft client data migration. These releases were made available to Roadsoft customers prior to the start of the TAMC PASER collection season on April 1. The reasoning for this was to ensure that local agencies and regional/metropolitan planning organizations (RPO/MPO) were all on the same version of the MGF for data collection. However, in 2018 there wasn’t an update to the MGF due to the Michigan Department of Technology, Management and Budget (DTMB) and the Michigan Department of Transportation (MDOT) technology upgrade of the MGF and Linear Referencing System (LRS). Though inconvenient, the ongoing statewide MGF and LRS software upgrade will provide an extensible platform that will streamline workflows for both state and local agencies, while providing more accurate and timely data. The upgrade process has caused a delay in the delivery of the updated MGF version 19 (MGF V19) to the Center for Technology and Training (CTT). The CTT is actively working with the DTMB and will provide an update to Roadsoft that will include the MGF V19 during the summer of 2019. This timing is different than in past years when the data migration occurred prior the start of the data collection season, and could affect the data collection cycle of some agencies and/or RPO/MPOs. For Roadsoft users, following the “Rules” For Dealing with Collection and Map Update In Roadsoft will ensure that data collection and submission goes smoothly. Microsoft announced that SQL Server 2008 and SQL Server 2008R2 are reaching the end of their extended support lifecycle in July, 2019. Microsoft’s blog contains more information regarding their support termination. Due to the timing of Microsoft’s extended support termination, the CTT has determined that our support of the affected Microsoft products must end prior to our Spring 2019 software release. In response to this announcement, the CTT ended Roadsoft and MERL support for both SQL Server 2008 and SQL Server 2008R2 as of January 1, 2019. After January 1, 2019, the creation of new Roadsoft and MERL databases will cease to function on SQL Server 2008 and SQL Server 2008R2. The 2019.3 release of Roadsoft will prompt customers to update if they connect to SQL Server 2008 products, and future Roadsoft releases will not allow connections to any of the SQL Server 2008 products. The decision to discontinue support on SQL Server 2008 and SQL Server 2008R2 is a necessary step to ensure the safety of the systems that operate our software, and to retain the integrity of agency Roadsoft and MERL data. Customers with existing databases on SQL Server 2008 and SQL Server 2008R2 (including full SQL Server and SQL Server Express) are encouraged to begin discussions with appropriate parties as soon as possible, particularly if an update or purchase of a newer version of SQL Server is necessary. Customers using the CTT-provided SQL Server Express will have the opportunity to update their 2008 or 2008R2 SQL Express instances using a CTT-provided update installer. We will announce the update installer availability in the near future. The CTT is continuing support for SQL Server versions: 2012, 2014, 2016, and 2017. Help documentation for locating the SQL Server version is available in the Roadsoft Manual at Locate SQL Server Version. Instructions on how to convert user data from SQL Server 2008 and SQL Server 2008R2 will be posted shortly. Microsoft announced that after January 14, 2020, they will no longer provide security updates or support for Windows 7. In response to this announcement, the CTT will also no longer support or allow new software installations on PCs running Windows 7 starting January, 2020. Depending on the age of the computer running Windows 7, hardware upgrades or computer replacement may be required to upgrade to Windows 10. It is recommended that all Roadsoft and MERL customers still running Windows 7 investigate upgrading to Windows 10 sooner rather than later. Chances are good that the performance gains with a new computer running Windows 10 will outweigh the cost and inconvenience of the upgrade. Roadsoft system requirements can be found online at https://roadsoft.org/system-requirements. These suggested system requirements are for small to moderately-sized agencies running Roadsoft standalone (client & database on one PC) and Laptop Data Collector (LDC). Larger agencies may need more computer power; if this is the case, please contact Roadsoft technical support at roadsoft@mtu.edu. Roadsoft Roundup v18n4 is now available. This issue provides a wrap-up of the 2018 Roadsoft User Conference of the United States (RUCUS), and provides information about the 2020 RUCUS. It announces the major enhancements to the Roadsoft Mobile 2018.12 app. It also announces that Microsoft is ending their support for Windows 7 in January of 2020. In response, the CTT will also be ending their support for Windows 7 in January of 2020. It concludes with a reminder that support for SQL Server 2008, 2008R2, and SQL Express 2008 has ended. The issue can be found at https://roadsoft.org/sites/roadsoft/files/RoundUps/roundupv18n4.pdf. The Roadsoft Roundup is a quarterly publication detailing updates to Roadsoft to keep you informed about the latest releases and best practices. If you have any questions or comments regarding the Roundup or its content, please contact the CTT at 906-487-2102. An update to Roadsoft Mobile is now available for download. Roadsoft Mobile version 2018.12 adds the ability to add, edit, and delete signs/supports, as well as culverts. In addition, a new Sidewalk module has been added to allow users to add, edit, or delete sidewalk features, as well as manage work orders and inspections. This release also includes a number of minor improvements and enhancements. The Roadsoft Mobile application, is available at no cost for both iOS (located in the App Store) and Android (located in the Google Play store). Important Note: Roadsoft Mobile 2018.12 requires Roadsoft 2018.11 or later. Roadsoft 2018.11 users wishing to use Roadsoft Mobile will need to update to Roadsoft Mobile to 2018.12.